Be the first to share your favorite memory, photo or story of Beatrice . This memorial page is dedicated for family, friends and future generations to celebrate the life of their loved one. 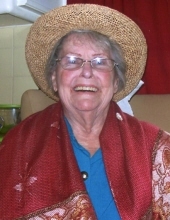 Beatrice Weisling, of Grafton, passed away peacefully at the Village Point Commons Memory Care Unit, on Friday, February 8, 2019, at the age of 86 years. Beatrice was born on May 1, 1932, in Milwaukee, the daughter of the late Emmanuel Derouin and the late Loretta (nee Bender) Derouin. She attended South Division High School, in Milwaukee, and graduated with the class of 1950. Beatrice was employed by Columbia St. Mary’s Hospital, on the east side, working as an instrument sterilizer, for over 20 years. Upon retirement, Beatrice enjoyed crocheting, painting, and spending time with her beloved cats. Beatrice is survived by her three children, Kim Hammond, Duane Weisling, and Randy Weisling, granddaughter, Tara Hammond, and great-granddaughter, Eva Hammond. She is further survived by other relatives and friends. Beatrice was preceded in death by her parents, sister, Mona Waldera, and brother, Paul Derouin. A Memorial Gathering honoring the life of Beatrice Weisling will take place on Saturday, February 16, 2019, from 11:00 AM until 1:00 PM at the Mueller Funeral Home & Crematory, in Grafton. In lieu of flowers, memorials of your choice are appreciated. The inurnment will take place at Immanuel Cemetery, in Cedarburg, at a later date. To send flowers or a remembrance gift to the family of Beatrice Weisling, please visit our Tribute Store. "Email Address" would like to share the life celebration of Beatrice Weisling. Click on the "link" to go to share a favorite memory or leave a condolence message for the family.